Eco labels and certifications for products, services and facilities provide a certified green trustmark for consumers and businesses who wish to choose more environmentally-friendly alternatives and make the right choice. The Eco-Office Label is a certification managed by the Singapore Environment Council (SEC), which is based on the Eco-Office Rating System. Companies can do an online self-rating first before deciding to apply for certification. Companies would be rated on their office activities such as: Environmental Policy and Commitment; Purchasing Practice; Paper Use; Printer, Photocopier and Fax Cartridges; Waste Reduction Measures; Recycling; Office Kitchen; Office Furniture; Energy Conservation; Water Conservation; Indoor Air Quality; Signs; and Travel. The Eco-Foodcourt Certification by SEC is for food courts that are environmentally friendly and employ sustainable practices. The key assessment criteria include having an environmental management system, the efficient use of energy and water, waste management and recycling, communication and education to stall vendors and patrons, and the use of environmentally-preferable resources such as non-styrofoam packaging, reusable or sustainable packaging or utensils. The Eco-Hotel Certification by SEC provides guidelines and assessment of the environmental performance of hotels. The certification looks into environmental practices such as energy, water, waste management, and guests and community outreach. Hotels can achieve different certification levels depending on how well the hotel performs, including Platinum, Gold, Silver or Bronze. The Energy Label is issued by the National Environment Agency (NEA) and is mandatory for registered suppliers of air-conditioners, refrigerators and clothes dryers to affix the Energy Label on their appliances. The Energy Label shows the energy efficiency rating and the energy consumption of the appliance. The energy efficiency rating is expressed in green ticks: 0 ticks (Low); 1 tick (Fair); 2 ticks (Good); 3 ticks (Very Good); and 4 ticks (Excellent). The appliance with more ticks is more energy efficient. The public can check the green ticks for different brands and types of appliances from this database of registered goods. From Sep 2011, the Minimum Energy Performance Standards (MEPS) will be implemented for air-conditioners and refrigerators. All 0-tick appliances and some 1-tick and 2-tick appliances will no longer be available. It is mandatory for registered suppliers of motor vehicles to affix a Fuel Economy Label (FEL) on their vehicles. The FEL is managed by NEA and shows the fuel consumption of the vehicle, which indicates how much fuel is needed for traveling a certain distance (L/100km, kg/100km or Wh/km). For cars with similar engine capacity, a higher fuel consumption means that the car is less fuel efficient. Check the fuel consumption of all the motor vehicles from this Database of Registered Motor Vehicles. 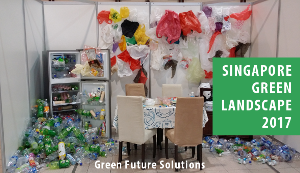 The Singapore Green Labelling Scheme (SGLS) is managed by the Singapore Environment Council (SEC) to certify environmentally-friendly consumer products and services. Green Label Products have to undergo an independent third party assessment of product environmental attributes based on a life cycle analysis approach. The product categories include: Batteries, Building Materials, Cleansers and Detergents, Electronics, Home Appliances, Lighting, Office Machines, Office Products, Organics, Others, Packaging, Paints and Surface Coatings, Paper Products, Personal Electronics, and Personal Hygiene. Search for green products in the SGLS Directory. The BCA Green Mark Scheme was launched in January 2005 by the Building and Construction Authority (BCA) to encourage more green buildings and sustainability in the built environment. The Green Mark is a green building rating system to evaluate a building for its environmental impact and performance based on five key criteria: Energy Efficiency, Water Efficiency, Environmental Protection, Indoor Environmental Quality, Other Green Features and Innovation. The Singapore Green Building Product Certification Scheme was launched by the Singapore Green Building Council (SGBC) in September 2010 to support the BCA Green Mark Scheme, and help the building industry move towards sustainability. The certification will provide consumers, building industry stakeholders, and government procurement system a listing of assessed and certified green building products in the following categories: Mechanical, Electrical, Facade and Roof System, Concrete and Structural, Interior System, Finishes, Recycled Material, and Renewable Energy. The products are assessed on: Energy efficiency, Water efficiency, Resource efficiency, Health and Pollution Control, and other requirements such as environment quality management system, technical performance, and innovation. The score would include: Certified (1 tick), Good (2 ticks), Excellent (3 ticks), and Leader (4 ticks). The Sustainable Manufacturing Label Programme was jointly developed by the Singapore Manufacturers’ Federation (SMa), SPRING Singapore and the Singapore Environment Council (SEC). The programme is for manufacturers to establish a baseline on their current sustainable practices and to guide their sustainable manufacturing strategies. The scoring criteria for the Sustainable Manufacturing Label includes: green corporate policies, product life cycle development, manufacturing processes, operations and facilities, and power and utilities usage. There are 2 types of Water Efficiency Label for water-efficient water fittings and appliances under the Water Efficiency Labelling Scheme (WELS). The Label under the Mandatory WELS is managed by PUB and includes shower taps and mixers, basin taps and mixers, sink/bib taps and mixers, flushing cisterns, urinals and urinal flush valve. The Label under the Voluntary WELS is managed by PUB and the Singapore Environment Council (SEC), and includes showerheads and clothes washing machines. The Water Efficiency Label shows the water consumption and water efficiency of the appliances and fittings. The water efficiency is expressed in terms of ticks: Zero Tick; 1 Tick (Good); 2 Ticks (Very Good); and 3 Ticks (Excellent). The more ticks shaded on the Label, the more water-efficient a product is. Check out this list of water efficient products with the Water Efficiency Label. Watch out for new upcoming eco labels such as the Eco-Retail and Eco-Community Club certifications by SEC, and the Singapore Carbon Label by the Singapore Institute of Manufacturing Technology (SIMTech) and SEC. We will update this guide when the new eco labels are launched. If we missed out any eco labels in Singapore, do let us know through our contact form. Thanks! Image credit: Energy Label via E2 Singapore; Fuel Economy Label via NEA; Green Mark via BCA; Singapore Green Building Product Certification via SGBC; Water Efficiency Label via PUB.